The past year pleased us with numerous chess events. But before we directly go to competitions of people, let’s discuss computer chess topic. The Rybka engine written by Vasik Rajlich was disqualified by International Computer Games Association for copyright infringement stripped of all the previous titles in June. The author of the engine was obliged to return all trophies and cash prizes. There is a curious interview with the author on YouTube, where he does not deny that he used certain lines of code from other programs. Perhaps all commercial engines in some way use algorithms invented by other developers. But let’s face the truth – Rybka was 150-200 Elo stronger than the other competitors at the time of appearance. For us, chess fans, the more important is that fact. Obviously the main event of 2012 is the the upcoming match for the World Champion title. 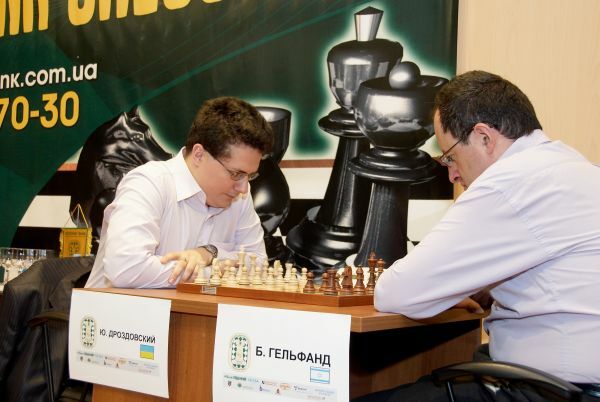 Boris Gelfand won the tournament in Kazan, Russia in the final beating Alexander Grischuk and became an official candidate. Many other great grandmasters played there: Kramnik, Topalov, Aronian, Grischuk, Kamsky, Mamedyarov and Radjabov. Later was promptly signed a contract with Vishy Anand for the upcoming match in May 2012. Unlike previous years, the prize fund was formed rapidly. Now the prize fund is around 2.5 million dollars. Just to remind, 20% or $500,000 will take FIDE as organization fees. Will the upcoming match archive a great interest? Anand tried to hide his openings novelties all previous year and didn’t play in full force. Gelfand scored just 5 out of 13 points in Wijk aan Zee 2012 taking one of the last places. This tells us that there will be no fight in upcoming match – there is too much difference in strength between the rivals. Traditional chess festival took place in Wijk aan Zee, Netherlands from 14 to 30 January 2011. Results of tournament A: 1. H. Nakamura 2. V. Anand, 3-4. L. Aronian, M. Carlsen. Nakamura deservedly became the first. 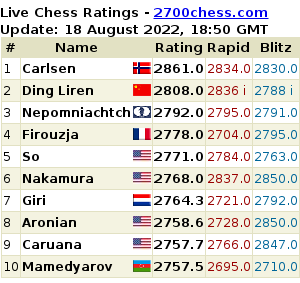 As we know, Garry Kasparov helped Nakamura some time last year. Traditional double round robin tournament of six grandmasters took place in Bazna, Romania from 11 to 22 June. Final standings: 1-2. M. Carlsen, Karjakin Sergey 3-4. H. Nakamura, T. Radjabov. Another well-known traditional double round robin tournament of six grandmasters took place in Dortmund, Germany from 21 to 31 July. Final standings: 1. V. Kramnik 2. L. Quang 3-4. A. Giri, R. Ponomariov. This was the tenth victory of Vladimir Kramnik – a phenomenal result. Double round robin tournament of six grandmasters took place in Biel, Switzerland from 18 to 29 July. Final standings: 1. M. Carlsen 2. A. Morozevich 3-4. A. Shirov, M. Vachier-Lagrave. Alexander Morozevich again began to show excellent results after some rest from chess. A series of good performances returned him to the top ten players again. Russian Championship Super Final took place in Moscow, Russia from 8 to 15 August. Final standings: 1. P. Svidler 2. A. Morozevich 3-5. S. Karjakin, V. Kramnik, A. Grischuk. Peter Svidler became six-time champion of Russia. FIDE World Cup 2011 took place in Hanty-Mansiysk, Russia in September. 128 participants played by a knockout system. Final standings: 1. P. Svidler 2. A. Grischuk 3. V. Ivanchuk 4. R. Ponomariov. The first three winners become candidates for the World Champion title in the next rounds. The tournament was remembered for the gentlemen’s behavior of David Navara in a match against Alexander Moiseenko. In clear win position David offered a draw which was accepted. The final Grand Slam event took place in San Paulo and Bilbao, Spain from 26 September to 11 October. Final standings: 1. M. Carlsen 2. V. Ivanchuk 3-5. V. Anand, L. Aronian, H. Nakamura. Rather weak results of V. Ivanchuk can be explained by stressful situation after a robbery near a hotel. Before that he confidently led. Traditional Tal Memorial held in Moscow from 16 to 25 November. Average rating of competition – 2776 – XXII record category. Final standings: 1. M. Carlsen 2. L. Aronian 3-5. S. Karjakin, J. Nepomniachtchi, V. Ivanchuk. The third round robin tournament London Chess Classic took place in the capital of England from 3 to 12 December. The final standings: 1. V. Kramnik 2. H. Nakamura 3. M. Carlsen 4. L. McShane 5-6. V. Anand, L. Aronian. Kramnik has shown that it is too early to write off. He confirmed in a recent radio interview that the next 4-5 years he is not going to give up chess. This entry was posted in news on January 23, 2012 by admin.